Happy New Year everyone, and welcome to 2015! Another year means another set of reading challenges/goals, and a thread to track them, and update us throughout the year. Feel free to set any target you choose, and include novels/short stories/manga/graphic novels, whatever you like. 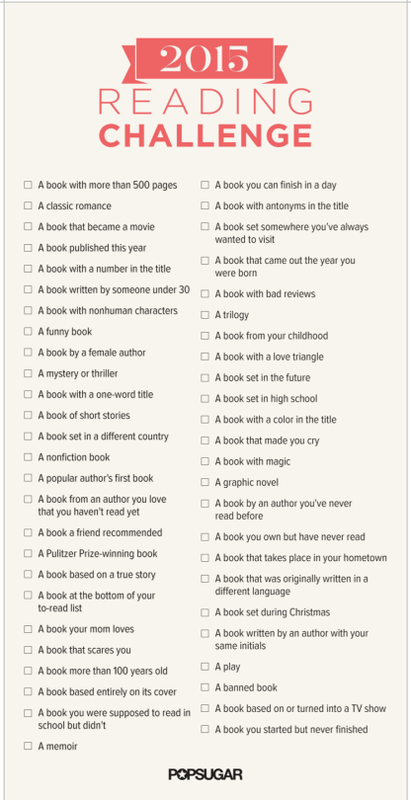 Just make a post with your goal below, and then edit throughout the year informing us of which books you've read. You can also include a list of the books you are currently reading, and the never ending 'to read' list! Good luck with your reading goals, and may every book you read be a good one! Alright, I made it to 50/51 last year, so lets try to make it 1 a week (even if it'll largely be 20-30 in summer and a few over the year). Aha! I was planning on coming online to make this thread if it had not been made already! I surpassed by 2014 goal of 250 books by at least 30 so 250 will be my goal again. Ok, so I read well more than my initial target of 50 last year, but we'll start in the same place this year - aiming for [strike]50. [/strike[strike]] 75. [/strike] 100 it is! 1. Egg & Spoon - Gregory Maguire. 2. Elizabeth of York: The First Tudor Queen - Alison Weir. 12. Katherine Swynford: The story of John of Gaunt and his Scandalous Duchess - Alison Weir. 19. Nureyev: His Life - Diane Solway. 20. Divergent - Veronica Roth. 21. Insurgent - Veronica Roth. 22. Allegiant - Veronica Roth. 23. Four: A Divergent Collection - Veronica Roth. 24. World of Divergent - Veronica Roth. 25. South of Darkness - John Marsden. 28. Sorceress - Claudie Gray. 29. The Complete Mary Poppins - P. L Travers. 30. Perilous Question: The Drama of the Great Reform Bill 1832 - Antonia Fraser. 31. The Hunger Games - Suzanne Collins. 32. Catching Fire - Suzanne Collins. 33. Mockingjay - Suzanne Collins. 34. Mary Queen of Scots - Antonia Fraser. 42. The Making of Markova: Diaghilev's Baby Ballerina to Groundbreaking Icon - Tina Sutton. 59. Vengeance - Ian Irvine. 60. Rebellion - Ian Irvine. 61. Justice - Ian Irvine. 69. Mistress of the Sun: a novel - Sandra Gulland. 73. The Taming of the Queen - Philippa Gregory. 74. Rome and Jerusalem: the clash of ancient civilizations - Martin Goodman. 75. The Cat Dreamer - Isobelle Carmody. 76. Shooting Victoria: Madness, Mayhem, and the Rebirth of the British Monarchy - Paul Thomas Murphy. 79. Early Settlers' Household Lore - Mrs N. Pescott. 100. The Lost Tudor Princess: A Life of Margaret Douglas, Countess of Lennox - Alison Weir. 102. Britain's Royal Families: The Complete Genealogy - Alison Weir. 103. Wide Sargasso Sea - Jean Rhys. Books I'm Reading: Wide Sargasso Sea to finish out the year. Alright so I just made my edited down target of 130 last year. Going to aim for my original target of 150 again this year. In previous years I've surpassed my goal of 100, however I really feel like I've fallen off the reading wagon lately (as well as the Ober.net wagon), so I'm going to start with a goal of 50 and raise it should it prove necessary/achievable. I'm going for 52 again, starting with an Ober Chron re-read while the trains are half-deserted and I can find a seat. So, I probably read about 14 last year so I'll aim for that again. Page count, according to the 14 that I remember, for last year was 3917, so I'll see how 2015 compares. 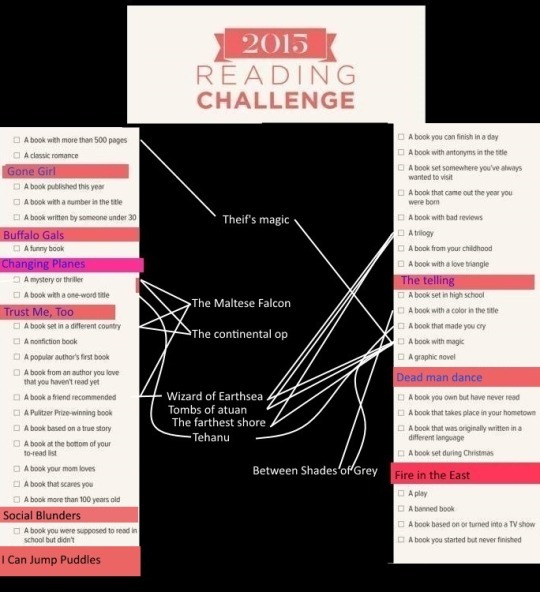 I am doing the popsugar 2015 reading challenge. not sure if it's come up in this thread yet because I got lost and had to find my way back, lol. Perhaps I need more coffee. This is the challenge. It ends up with 52 books as long as you read one for each. This is all the books I've read, (for more details on books add me on goodreads) the books in the middle fit into more than one category, so they're undecided. Some of the books I want to read double up, so I'll probably read more than 52 this year. I will start a goodreads forum post, if there isn't one already.